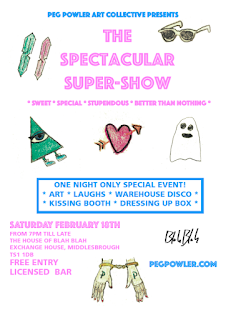 Artists and show-offs AJ Garrett and Rebecca Little founded the DIY art organisation Peg Powler in 2010 and for this extra super sweet special event will be presenting their unique brand of visual art and unusual fun to Middlesbrough’s fantastic House of Blah Blah. Art on display will include paintings, drawings, photography and sculpture by AJ & Rebecca as well as Peg Powler favourites such as Shaun Elliott, Joanne Taylor, Nuala C. Murphy, James Harris and Richard Milward. Rebecca, who has her own acclaimed club night in Liverpool and used to DJ in Uncle Alberts (remember that?!) 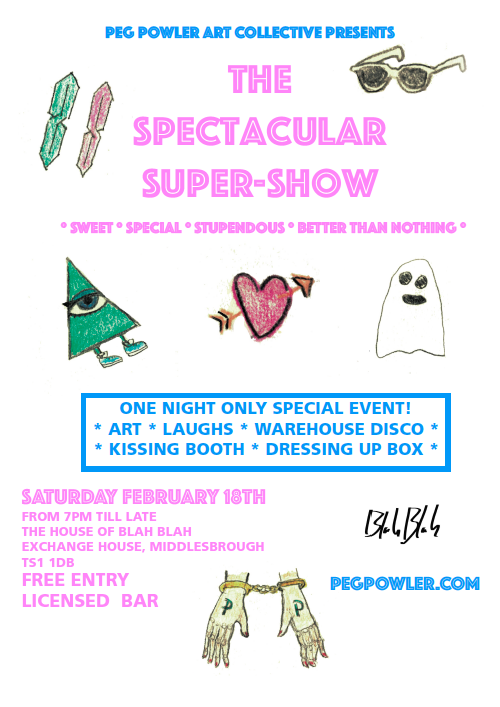 will be on DJ duties in the warehouse playing the best in alternative music that you can dance to including indie-pop, C86, 60s, post-punk, new wave, and some inevitable curveballs. It’s an early doors disco so you can start dancing as soon as you arrive and keep going all night if you like. And in the spirit of free trade AJ will be applying his best lippy and selling kisses. All welcome for a small donation, all funds raised by AJ’s tender affection will go to The Donkey Sanctuary charity (thedonkeysanctuary.org.uk).